Unexpected things happen all the time but certain things have the power to convey a message to the collective psyche of a nation. Less frequently there are events that can alter the course of human affairs on a planetary scale. The killing of Archduke Francis Ferdinand that ushered a century of unspeakable violence was one of those events. Certainly not the first crowned head of Europe to succumb to the dagger or the bullet, the case of Francis Ferdinand still remains a classic example of how a random and apparently inconsequential event can become the catalyst unleashing forces beyond human control. Francis and his wife Countess Sophie were the first victims of the Great War that was to claim thirty five million more casualties in and out of the battlefields of the world. The death of Ferdinand and Sophie was a fitting metaphor for the end of the old European order that they represented so well. The morning of last January 14 here in the American East Coast, I opened the web page of the Corriere della Sera and read for the first time of the horrible tragedy unfolding off the island of Giglio, a beautiful spot by the Tuscany coast that was now quickly becoming the center of attention of the whole wide world. The long-forgotten images of the 1970’s Love Boat came to mind. I followed the reports for days on the Corriere thus shaving a few minutes off the news cycle before the latest wires were translated for the world’s English media. I agree with Grillo but I think this metaphor goes even deeper. Yes, Italy is sinking under the weight of corruption, debt, and bad deals concocted by the new international class of financial pirates that can sink a country and condemn thousands if not millions of unsuspecting human beings to the most abject poverty without a second thought. Also starring in Grillo’s analysis were the “heroes” of the Italian Coast Guard who can detect a paper cup floating 200 meters from the coast but look the other way when these behemoths pass by about 100 meters from the rocky northern coast. Yet if a local fishing boat, a puny family-subsistence business happens to violate the limits of the ecological area… it is immediately detected, pursued, boarded, and impounded cargo and all, her master and first mate arrested and fined. Such is the situation that Grillo denounces. Severgnini points at how bad things must be in Italian society when someone like De Falco becomes a hero: his recorded conversation repeatedly ordering the captain back to the ship and diligently inquiring about the number of women and children, has achieved the cult status of a rock music hit. Yet he was doing nothing more than what he is paid to do when the situation requires his intervention. Not to criticize the impeccable performance of Captain De Falco who is most obviously an honorable man and a good officer, able to perform well under pressure. Yet why everyone started calling him a hero is something to think about. In my view the disdain for human life begotten by the perfecting of contraception since the late 60’s has created this Priapos mentality: man as a sexual predator and a Nimrod of sorts. It is appalling to see how many women these days seem to admire that “dangerous guy,” the alpha male lately personified in Brad Pitt and others like him. How far we have wandered from the likes of Cincinnatus, the strong farmer, decisive warrior, cautious man of state, capable to serve, impervious to adulation, incapable of theft. The serene strong masculinity of Cincinnatus is hard even to imagine today. Only George Washington comes to mind when those virtues are enumerated. Virtue: a little word that comes from the Latin vir meaning a man. This absence of natural manly virtue, this general lack of true manhood, has created a vacuum: a silent craving for the image of that real man who can be trusted to lead and preserve the family in times of trial and in the daily fight for survival. If there is a failure of manhood, there is an epic failure of fatherhood. I am sure I am not the first to define Modernism as a rebellion against fatherhood. The last assault started in the heady days of 1968. Those days saw the end of the old model, the good American father who returned form the hell of World War II to continue serving as the world’s most productive male. Robert Young in Father Knows Best evolved to be the androgynous Brady of The Brady Bunch, where two butchy females run the house with him remaining in a feminoid passive role. From there it is downhill all the way to Homer, the father-as-village-idiot of The Simpsons. People feed on those images and then it is impossible to surmount the expectation that fatherhood is rooted in failure. Thus we arrive to the final stages of the androgynous society. Gone are the Beatles’ sideburns and mustaches, or Sinatra’s womanizing ethos… now the model is Justin Bieber, a girly kid who would look like a 60’s female teenager if he could only grow breasts. Something is amiss. Girls know it, grown up women know it too. There are not many real men around. All of those things are at play in the public’s perception of good Captain De Falco. The sad part is that one man simply fulfilling his duty and doing something absolutely unremarkable becomes a hero. That betrays a hunger for manhood that is latent and potent. The man did not land at Normandy, he did not face enemy fire in the streets of Berlin, nor he did crawl the beaches of Tarawa but we see him as a hero because we miss the father-hero, the model sent to the attic by the Modernist culture along with the old Christian morality of the West. The comparison with Schettino the commander of the Costa Concordia was inevitable, a monster was born and also a hero: one despicable, the other admirable. Our metaphor thickens. This world ruled from the high towers of finance can be compared to the Costa Concordia. What do we have at the Costa Concordia that can qualify this whole tragedy as a metaphor of a world out of control? First we have the 4,000 men and women crammed into a floating shoebox 13 decks high with barely an evacuation plan that no one really knows well and has to be effected among a Babel of crew and passengers all speaking two dozen different languages. Through a female crew member equipped with a hidden camera the Corriere della Sera reports that the service crew on a typical Mediterranean cruise ship works fourteen-hour shifts with no days off for several months. Mandatory personnel and operations meetings are scheduled during their scarce off hours. Employees must pay for everything they wear or consume. The personnel agency, associated with the larger company, charges 3,000 euros for the “privilege” of being hired. There are other fees that employees must pay. Male supervisors routinely harass female employees. The pressure is so unbearable that suicide attempts are frequent. Recently two Indian nationals hanged themselves; others have jumped overboard or had nervous breakdowns out of sheer lack of rest. They simply could not take it any more. So here we have a fairly good equivalent of the world outside: the womanizing incompetent captain, the abusive middle management, the oppressed and exploited crew, the passengers treated like cattle their money fleeced at every turn. Sound familiar? So we arrive at that fateful January 13: the master was too busy having fun and he made a turn ever so slightly late. The ship hit a rock and started taking in water but commander Romeo was apparently too busy wooing an unregistered female passenger. He did not inspect damage and ignored the alarms coming from the lower decks. The videos show that while he dined the ship was taking in water. Eventually he had to rush the boat out of deep waters and managed to get close enough to the reefs to prevent the total loss of life and vessel. All the while people were dying. It happens once in 100 years: the Titanic in 1912 when communication was by “wireless” and the New York Times coverage of the disaster could turn it into America’s newspaper of record; and the Costa Concordia in 2012. What a coincidence that the loss of the liner Titanic can now be seen in retrospect as a harbinger of the demise of the world order that collapsed in 1914. Is God sending us a similar warning through our TV sets? Maybe He is using the shiny screen this time, since most Westerners have ceased to go to any church but we surely keep watching television. It seems to me we have completed the metaphor. Our world is in danger because fools are in command, people that can’t imagine what reality is in the third class deck. Yet their everyday decisions cause many people to lose their jobs, their houses, and their livelihood. The captains up there don’t care about what goes on the ground. Their life is safe in the upper levels of this troubled world. Recessions may come and go but they will always have a job; they will always have a safe house, a car, servants, lovers, nice dinners, and golf. When the time comes to balance the books with some uncomfortable loss, their army of lawyers and accountants will navigate the Byzantine complexity of contracts and laws to force those ant-like men and women sixty stories below to take the brunt of the sacrifice. Their cries from below cannot be heard in the ivory towers above. It is business as usual and they will have dinner with a lover while neighborhoods far away riot and burn, and young soldiers sacrifice life and limb fighting in distant lands for the god of high finance. Restless populace? The police will take care of that. That’s what we pay them for. We have defined our metaphor, this ship of fools, this sinking world. Is there a message in all the coincidences or just serendipity? You decide. 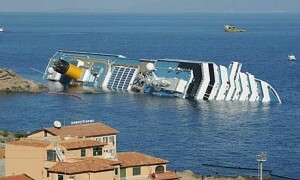 The Costa Concordia was wrecked on Friday 13. It has 13 decks. Thirteen is a number very connected with the warnings of Our Lady of Fatima. The island’s name is Giglio (pronounced GEE-LEE-OH) that is Italian for “lily,” a favorite of the Virgin Mary and one of her symbols since antiquity in the Italian culture. The ship was christened Concordia (meaning “in agreement, accord, getting along”) but during the ceremony the champagne bottle bounced off the hull unbroken. That was indeed a bad omen. The name of the company, Carnival, comes from the Latin word for “a festival of the flesh” something very apropos to describe some of the activities of the commander during the early hours of the ordeal caused by his own folly. Was this a warning to the world? If it was then the metaphor was perfect. In fact a more perfect metaphor than any human being could design. In the meanwhile we are heading for the straits.